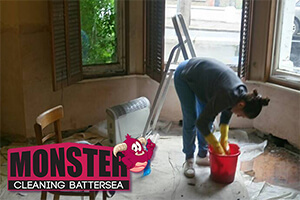 As one of the best respects teams of professional cleaners in Battersea and Greater London as a whole, we at Monster Cleaning are proud to say that we have the means and the skills to meet all your potential requirements, means and expectations when it comes to guaranteeing your household or office space is well sanitised, hygienic and overall in a top condition. The premier quality after builders and deep cleaning service in Battersea we are happy to bring to your attention here speaks volumes about that. The thing is that this particular line of work – clearance of construction debris and deep sanitation of even the smallest properties, is quite complex. It requires certain amount of skills, knowledge and specialised equipment that are not readily accessible to the regular homeowner. Fortunately, you have us to step in and take charge of the project. Our trained staff is not going to let you down no matter whether you are hiring us for deep cleaning and maintenance or after builders clearance in Battersea. Our licensed, insured and very energetic team members is going to carry out the job that you have for them in a manner that is up to all industry standards and on a schedule that is going to be fitted to all your requirements and personal preferences – without any exception. We’d like to note that our services are all a hundred percent eco-friendly, among other things. All detergents that we employ are free of dangerous chemicals that may endanger yours or your family’s health. Furthermore, all construction debris and other rubbish we are going to remove from your property are going to be properly disposed of and recycled at a location designated for the purpose. Feel free to contact us now and learn more about our excellent prices. Our rates for after builders clearance and cleaning start from £15 per cleaner per hour for domestic properties, and £16 per cleaner per hour for commercial ones. There might be some additional charges applicable for certain cleaning products and equipment too.